Meanderings and Reflections: "Meet my dad, he's my best friend"
The parent-child relationship can take different hues and turns. But one thing which baffles me is the proclamation of the child saying, "My father/mother is my best friend." I am never able to get over the fact that parents can be friends of their children. Well, I can understand that the relationship between parent and child can be great and quite affable but friendship is something I cannot reckon with. Well, how can a parent be a friend? Impossible. If parents become their children's friends, I can foresee many problems there. Parents, to keep up with the child's lifestyle resort to acting like the child in terms of clothes, language, among other things. I would like my parent to be different from what I am, in terms of language, style and disposition. If my father or mother speaks the language that I speak, using the same slang and other things, it may seem cool but then where is the line that separates us? Generation gap is but natural in a relationship that is apart by ages. I guess that is healthy. The parent can speak of a time that is hitherto unknown to the child. Every relationship has a specific role to play and though there can be occasional slipping in roles, there cannot be a role-reversal. I would like my parents to be friendly but not my friend. I have read and heard of many parents who want their children to share everything with them. It is quite healthy on some levels but there are some things that cannot be shared. On the other hand, if a parent claims to be a friend, then the parent has to invariably think and share the child's problem as a friend. While some parents find it easy to be a friend when it comes to using language and style, in the areas of problems, the parent has to precariously tread between roles. After having said all this, I should add an disclaimer that these are my observations and perceptions. I am not yet a parent and so my observations are only hypothetical. But I do think that when I become a parent, I will be a friendly parent to my kid and not a friend. If I become a friend, my child would get a tad confused. Well, parents and others, sound me on this trend. That is why I left a disclaimer at the end. You are best friends with your girl, I can understand. But I guess she feels great when you are around and that is the natural role of a father. When I look around, I see so many parents calling themselves "friends" and acting quite weird. I have also heard my own friends complain how their parents try to be 'cool' and say "we are your friends." Parents are parents, not friends, I reckon. I both agree and disagree with you. There are two kinds of friends, good friends and bad friends. Good friends are those you can trust and learn from. Bad friends are ones that will share all their bad habits with you. Let's say the child is 16. The parent can be the child's best friend by acting like a 16 year old, or demand that the 16 year old child acts with maturity, like an adult. If the parent stoops to the child's level the child will likely fail, but if the child raises himself up to the parents level, they can have a very close relationship, even one that is closer to peer to peer than it is parent to child, because the maturity level trumps all. That is not to say that once in a while (and it will happen) that the parent of this positive, mature friendship won't have to act like a parent and treat their child like a child. But when this happens, if the child had been mature to begin with, it will be an even more positive experience. Because now the child has lost the trust they had respected before, and they'll seek to get that back. How interesting are your insightful thoughts (as opposed to my "unsightful"--grin!) on this and many topics, SD. My parents were friend as only a jailer could be a friend. For ill or good, I broke out of that jail at age 17--happy about that to this day! Young one, you will go far, whether in the teaching world (I would hope), or in any field you might choose. PEACE! OH! Forgot...I believe that when these others are grandparents they will see the difference. That is, God gives children grandparents to be role model 'friends' to balance the generational structure. To reverse this thinking, a real 'friend' will be hard-pressed to experience that singular love required of a parent. As you, Susan Deborah, this is MY opinion--grin! But...PEACE at any price. Oh, did I write that? Personally, the 'friendship' a parent has with their child is so different than the friendship between peers. A parent needs to be a friend in some matters, a mentor in others, a disciplinarian in others,and a protector, but never a judge. When I say disciplinarian, it's being able to correct a child appropriately, when boundaries/moral or social standards have been crossed. It's natural and good that children as they grow push against the rules/boundaries, -they're building their own sense of independance, and standards they'll live to, and here the parent needs to maintain consistancey . The problem with being a 'friend' in these situations, is being fearful of disciplining your 'friend' and so allowing the boundaries to be breached or constantly changing. Children do push the boundaries. It's natural. But more importantly they want you as a parent to maintain them. They want, and need you to be strong morally. Children are testing you, your character, your moral strength , and don't want weakness from a parent. So difficult to be a 'friend' in these circumstances. Our 3 children are in early 30's. We are now great friends. We now talk about what it was like growing up. They tell us they were testing us during those rebellious years, but they also tell us now they love us more for not giving way, and maintaining standards. An example- our rebellious daughter of 14 always fought like hell to be able to go out every Friday night past 10pm. Every Friday a row. Sneaking out/brought home by police when we thought she was in bed. Til one day we said OK.
From then on, she stayed home. Eventually we asked why she wasn't going out. "Because you don't try to stop me anymore." We all laughed together. No further rows. Respect from both. She now knew what our expectations were. It's a battle of wills. And parents need to example strength of will, so there is a standard the child can aspire too. I think parents need to concentrate on being mentors first, then friendship follows naturally. All that said, you’ve got a point worth pondering. Can we maintain parental authority and still be “friends?” I think it’s quite possible as long as we aren't authoritarian. "I would like my parents to be friendly, but not my friend" - great sentence, and you are of course right. If you look around you, you'll see many anomalies as a result of parents wishing to play the role of friends rather than that of parent, which is a more difficult one. These 'friends" expect the teacher, the school to educate; in the end, children nowadays get education nowhere. Oh good post and some good ideas. From my personal experience my mum is my best friend. Growing up there were moments where we didn't see eye to eye and time has stood the testament of that. What is a best friend? Someone who is there for you, someone you would give advice to or go to advice for. Someone who knows you, there are loads of things and for me that is my mum. She is my shopping buddy, my relationship guru and my friend but most of all she is my mum. I have the best of all worlds. With my son I am the person he goes to, the person in his life that he trusts and we have fun. We have a line but he knows that I am here for him no matter what. I would not talk to him about matters that concern me but we are friends as well as family. I know the dynamics will change as he gets older but I will hope that as time progresses he will see me not only as his mum but as his friend. Friendship is friendship. As Jim told, it is only one part of the complex relationship. i think it is a good way for being approachable. but the relationship cannot be wholly based on friendship. wish all a great sunday. Hmm.. after certain age.. it is all similar to relationship between two individuals... it is better for kids as well as parents to learn more about each other as people rather than parent child obligation. Dear Susan, I agree with you completely. Not having the privilege to be a parent, I still have in my perception a certain frame of rules about parenting. A child needs to be feeling secure and supported - it needs to feel that a parent is a stability that is in charge, but in gentle and kind way. Children need someone to take the lead. On the other side, later in life, parents and kids can be great friends. Today I see my parents more as friends - as human beings, with flaws and problems. ;) They are still my mom and dad and can still put me in my place, but I feel equal with them and respected by them in a new way. Today we not exactly friends, we have own thoughts, language, style, clothes, etc... but we understand each other as a friend would! From experience, I am a parent first. The friendship I have with my sons have changed over the times. Now since the boys are adults the relationship I have is that of friends. This is what my boys have said to me over and over " mom we are so glad that you were more of a parent during our teenage years than tryin to be our friend"
Again this was my experience and it may differ from others. Susan - I think you're referring to parents who try to be 'buddies' with their kids. So anything goes....And they lose control of authority. But parents can be the people we confide in, take our problems too, love to hang out with and thus be our friends. What a provocative topic Susan. I agree with you. There are boundaries in any relationship and each relationship has a primary purpose. To me parenting involves teaching/disciplining, guiding, and loving unconditionally. My daughter is an adult now and sometimes she tells me I am her best friend. I think she would like that to be true, but in reality I am a friendly Mom and she would hardly share with me the things she shares with her friends. Have a great day Susan and keep thinking of topics that stir the mind. it rather is how it made them FEEL!" Just remembered that, thought it was appropriate here. Thank you SD, for a VERY thought-filled couple days--from your blog post! Have been thinking about the question. I cannot be my boys friend, simply because a relation between friends is a relationship of equals. The relationship between parents and kids can't be of equals since a parent needs to make decisions on behave of the child and bears the responsibility for their well- being. Parenthood involves friendship with the children. But no, it is quite a hypocritical thing. My dad tells me, "I am always your friend until you do something wrong and then my dad side turns up". But hey, definition of friendship is subjective. I do believe that every relationship has an established pecking order. I hear and understand exactly what you are saying, Susan. and the reverse is true. If my friend decided to discipline me for something I did wrong, then I would question what kind of relationship we have. My children have also thanked us for the guidance they grew up with. How much ever I will experience being a parent when I have children, I have written this from the experience of being a child/daughter. I can never see my mother as my friend. I trust her and she, me. We speak everything but still we aren't equals and in friendship the two are equals. Sorry to stump you but I disagree. Welcome here, Lisa. Glad to have you here. Point taken. I hear you when you talk of two different kinds of friendship. Inspite of your keen observation, the role of parenting can be quite friendly but that does not mean parents could be friends. Steve, you make me smile from ear to ear with your thoughtful and humourous insights. Thank you for your very kind words. Glad to have met you in this space. Fine line, quite true, Brian :) Hope the week is unfolding well. Welcome JP here and thanks for your insights. I hear you when you express that the role of parents is manifold. Thanks for that long comment. I appreciate your time and insights. You have beautifully explained the different stages in the parent-child relationship and illustrated them with apt examples. 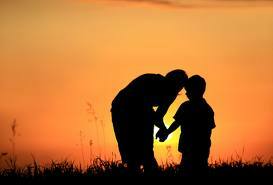 I have to agree with you when you say that parents are mentors first. But parents need to be authoritarian at times otherwise it becomes a bit fuzzy. I am glad that you hear me. You are right in pointing out that some parents expect the school to teach the children everything which is not quite the right thing to do. Parents should be the first role models of children. Thanks for your kind words, SJ. They are indeed welcome. A parent can ofcourse take the role of different persons but that of a friend cannot be the most supreme one. I do hear you when you say that the dynamics change according to the age. True. Thanks for coming by, Harish. How beautifully you have described the relationship, Zuzana. And you have reiterated that one does not have to be a parent to talk about this issue. Like you, even I, am writing this post from my experience of being a daughter and also observing kids. Karan, these days the tag of a friend is being given to every single relationship and so friends have lost their value, I reckon. Especially in the Indian scenario, parents have a different role to play. Quite well-said. Your experience pertains to the general Indian sensibility. We can do everything with our parents and they can still be parents. Why should they become friends? "Each relationship has a primary purpose" -- Quite true, Myrna. You have brought out the significance of each role quite accurately, here. Good to have you commenting to our posts again, dear Myrna. It is a joy to read your insights. I agree with you and think you actually have a wiser grasp on this than many parents out there. I hope my son feels able to share with me, talk with me and have fun with me but I also hope he always sees me as a loving parent and guide. As for my own parents, I am an adult now and we are very close but I still know they are my parents. :) We can talk like friends and enjoy time together like friends but I know that they are still in fact there to offer me guidance when it's needed. Very well written! I hope you have a lovely week. I hear you, Elizabeth. Your point is quite appropriate. It has been a long time. Good to see your comment. I don't think we can use the word "hypocritical" here but the roles get confusing when parents attempt being a friend. But as the children grow older, the roles keep reversing. I guess the parent-child relationship is quite organic and dynamic. Right said, Hope. I understand when you talk of the different roles each individual plays in a child's life. The topic has stirred quite a hornet's nest, Colleen. I completely agree when you say that parents are parents. They might be close and free with us but still they are our parents. As for the opinion, I hear you again. Thanks Colleen for writing insightful comments. I am glad that I have some excellent readers/bloggers/friends who stop by here. True. I hope you will come back and write what you think years later :) Quite far-fetched, isn't it? Ha hA. I think it depends on age, Sus. Teenagers and tweens shouldn't be friends with their parents. This is the phase of their lives that they need guidance and authority figures. "Friendly but not friends" is a good rule at this age. But when they become mature adults, say 30 or 40 (like me), the generation gap closes a bit and they can be friends with their parents. You are right, of course, Susan. A child needs loving direction in life. A true parent offers trust, affection and love. I have seen children who have a friend relationship with their parents grow up to be misguided adults. A father's and mother's role is to parent. I think so, too. I missed out teh 'age' factor but inspite of all that a parent is a parent and will remain so. Welcome aboard and thanks for the words of appreciation. It is highly appreciated. Please do come by when you feel like it. I know you would agree with me, Angie. Glad that you do. Hope you have been well. Things were/are a bit busier this side. Susan, I become a mother at 39 and 40 years old respectively. You can imagine the gulf-age gap between my children and I. I am also very much old-fashioned in my mindset. However, due to my observations of parental autocracy practiced in our Oriental Cultural Society that gone haywire - there were more troubles generated in that system than you think in regards to Parental Role towards Children where parents became abusive of their power and authority that led children to rebel. I saw that when I was a child, as a teenager and as an adult. Thankfully, even if my parents were very strict, we developed open communication in our family where our parents confronted us on issues of growing up with openness, frankness and straightforwardness. Of course, not all things went smoothly but at least we kept the moral ground of our upbringing at par. We did not get pregnant, and nobody made someone pregnant and did not commit. So when I became a parent myself (I am a single mother by circumstances) at an old age, I was pretty straightforward to my children in a very affectionate environment. Our relationship was Parent-Friends. I explained it to my children so as a Parent, they would listen to me and respect me; and, as a Friend, they would come to me and confide in me anything that bothered them. I know of many children who tend to be secretive or have that fear of telling their parents if they do wrong by commission or omission. Again, there were bloopers somewhere on the way too but I was pleased of the reasonable actions and behaviours of my children. Parents-Friends is what I will recommend to aspiring parents. The bottom line is: Open Communication, not condemnation if something goes wrong in that relationship. Friendship, love, respect, trust and understanding are the most vital factors to make Parents-Friends relationship work. That way, there is no barrier and no wall between parents and children. By saying this, I did not imply that we are perfect family. All I say by applying those of the above, nothing will be compromised as to parental leadership, values and principles. Well, Inday, open communication and no barriers can be done without trying to be friends as well. On second thoughts, I guess every parents have their own way with their children. I was just trying to state things from examples I know. Thanks for your long insight and the time taken to type it down. It is much appreciated. Sorry Susan if I sound preachy but I assure you it's not my intention. ^_^. I am more than happy to share a slice of my personal experience in parenting. Thanks for accommodating me. And here's the Link I promised. Inday, you are so sweet. And of course, you can be preachy. It is quite welcome here. I am a college senior and I am a very social person. I have tons of friends at my university, from HS, from my childhood. But my family is everything to me. I can say my dad is my best friend. My parents are my best friends. That does not mean they act like me, or they wear Tom's shoes, or anything. It depends on how you define "friend". They are the adults they are, 40 years married. We just love to share, to talk, and they never tell me what to do: they only suggest and advise, and we share viewpoints, discuss political and religious topics, and just about anything. We disagree in many things as much as we agree on many others. They taught me all my values, though. Principles. My dad and mom aren't perfect, but we always share the love at home and with my siblings. We are very united. And when we moved to the States from another country, we got united even more, to this day. When I had no friends at school, they were there for me, and we shared more than ever. I don't tell my friends to not be misunderstood, but my parents are my best friends. When I break up with a guy, when you loose your job, when you are happy about getting a new job offer...they are there for me, in the ups and downs; So are other special people, but mom and dad and rest of my fam hold the number 1 place. They never fail. Love never fails at my home. They are there for my siblings too, though they are married and with their own families! I would have been glad to see your name here. Welcome and thanks for coming by. Well, things are different to different people. And culture also plays a dominant role. I just thought friends are friends and parents are parents. Maybe a friend can be motherly but that does not make him/her our parents and similarly parents can be very friendly and great in understanding us but somehow they cannot be friends, according to me. My mom and I share a great relationship as well and she has been there throughout, but still she is my mom and I just cannot see her as my friend. All said and done, we have our own opinions of topics. Glad to read your point and do come by again when you find time and inclination.